Chock full of fresh seafood, you'll love my version of this Classic from Marseilles. 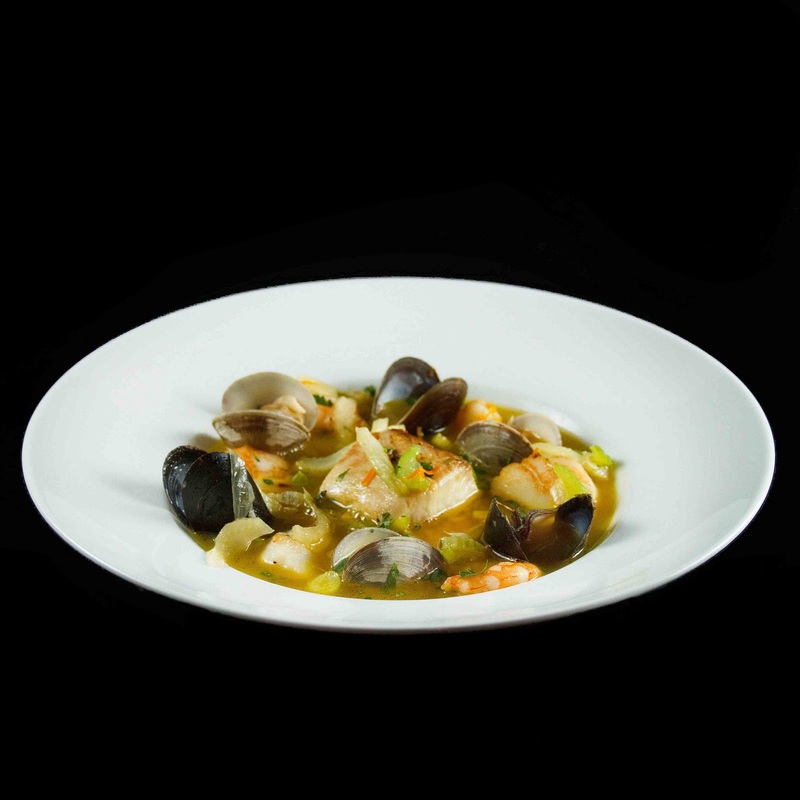 Clams, mussels, shrimp and scallops simmered in a light saffron broth. Simply delicious! Quite a few years ago when we were traveling through France, we happened to spend a few hours in Marseille. Unfortunately, we spent our time in the train station in sweltering heat waiting for the TGV. This had been the last leg of our trip through the south of France, we had just spent a few days in Nice and had begun our way back with a stop in Aix en Provence. What a perfect city, we had stayed on the Cours Mirabeau whereas the guidebooks stated was the place to be while in Aix. That turned out to be a good thing and a bad thing. As we walked to our hotel we were swept away by the beauty of the city, its little cafes and tree-lined streets, its many fountains and of course the footsteps of Cezanne…….we were in love and in love with the city…sigh. We checked in to the hotel and after turning on the air conditioner (did I mention it was sweltering) we left for a tour of the city. We walked were Cezanne walked and ate in sweet little cafes, and sipped our cafe au laits….sigh….life was good! Then as we headed back to the hotel for a much-needed rest before the next day brought us to Paris, we found a problem with our room…..no air conditioning….did I mention it was sweltering, I mean the kind of hot where you sweat standing still. As we struggled out of bed and headed for breakfast, we tried to be happy, we were of course in Aix, one of the most beautiful cities in France, and after breakfast we found a market, and sampled fruits and made our purchases for the train ride to Paris. Life was good, we were exhausted, but life was good!The train station was only a few blocks away, and it was packed, but we had time…..when I finally made it to the window, I was told I was at the wrong station, we wanted the TGV, and it left in 10 minutes!! We couldn’t make it, but we could go to Marseille and get the TGV from there. Ok, it’s not that bad, so I asked for tickets to Marseille on the local train, that all the other passengers had just boarded, I was told No, the train workers had just gone on strike. Can you imagine……but I could get the bus to Marseille. Of course, I could…lol….and where was the bus? Oh just around the corner 500 meters away. So we boarded the bus and headed to Marseille, and that is where our story began, as we waited in the sweltering heat for 3 hours for the TGV to Paris. But it was a story to tell, and it only got stranger as we got to Paris, but that’s a story for another day. We weren’t there long enough to have a meal, but we did promise each other to come back one day and enjoy that beautiful old port city, where today’s post originates from. So my friends, I give you my version of the classic fish stew, Bouillabaisse. There are a few essential ingredients that make bouillabaisse what it is, we need fish, and a lovely fish stock. 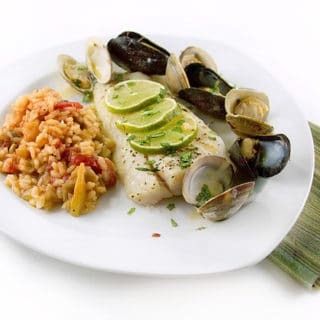 After that, you can get creative with the seafood you have on hand, or what you like. For me that was shrimp, scallops, clams and mussels. For the stock you need celery, fennel, orange rind, and of course saffron, again adding other spices and vegetables you enjoy, tomatoes, bay leaf, basil, fennel seed, and leeks make a nice addition too. I’ll even let you in on a little secret, feel free to add a bit of chicken stock to your fish stock if you would like it to have a sharper flavor, I don’t know how else to describe it but fish stocks can taste a little soft to me, so I do add a bit of chicken stock just to fortify the taste. I will admit that I did not make it in the classical tradition as a simmering stew, I wanted each ingredient to remain intact and to taste exactly as it would if eaten separately, so my ingredients were not all combined until the very end. I hope you like it! There are many different ways to serve bouillabaisse this is just my take on this classic dish, and I do hope you give it a try sometime. 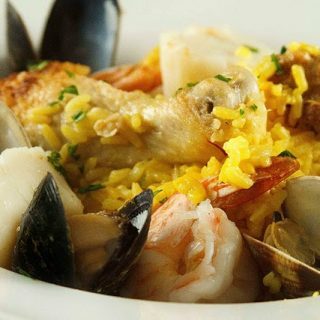 And if you love seafood you might like my Paella recipe. 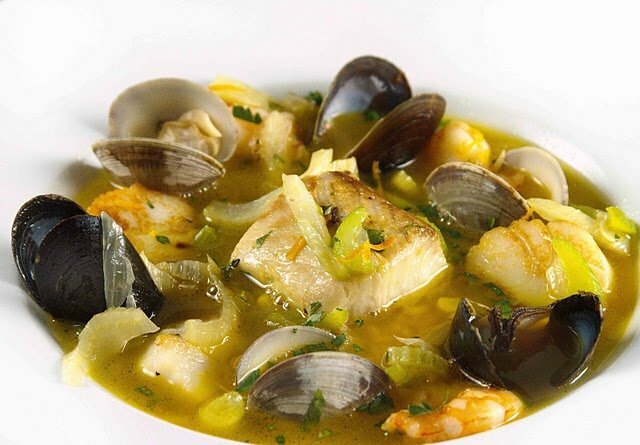 If you’ve tried this Bouillabaisse recipe or any other recipe on askchefdennis.com please don’t forget to rate the recipe and let me know where you found it in the comments below, I love hearing from you! Prepare your stock with any fish scraps, shrimp shells or other seafood shells you may have, let it simmer for about an hour or longer if you can, and add a little bit of chicken stock (about 1/4 of the total) allow this to continue to simmer as you work through the rest of the dish. Next prepare your rice, I made it like I would any other rice only using some chicken stock in place of the water and adding 8 strands of saffron. Cook your rice and keep warm. As you begin to bring the dish together for the finish in a saute pan add your fennel, celery, and garlic and saute in a little bit of olive oil. After about 2 minutes add your fish pieces and sear them well on both sides, not add your scallops and sear them on both sides also. Add the clams, mussels and shrimp, orange rind, and thyme, cover and allow to the mussels and clams to steam open, this should take about 6 minutes. When the clams and mussels have opened add a splash of white wine to de-glaze the pan and release all of the flavors stuck to the pan back into the dish. Your rice should still be warm and your stock should now be boiling. Add one one large spoonful of the saffron rice to the bowl and place the fish on top of the rice. 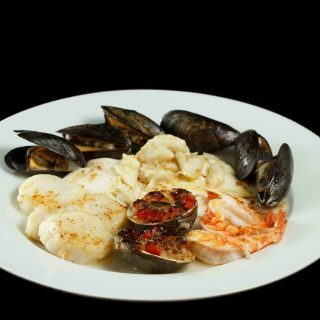 arrange the mussels and clams in the bowl, and add the shrimp and scallops. Ladle the boiling stock into the bowl and serve immediately with crusty bread. The stew looks delicious, and I love the story! Love your interpretation of Bouillabaisse. This soup also has special memories for me — there was a wonderful restaurant in Menton that made the most incredible Bouillabaisse. Sounds good! Nice pictures. Keep up the good work. Have a good one. Omg I am loving this recipe. what a story indeed! Dennis you take us all with you with every story you tell…..this dish looks incredible! What a story! Those sweltering days are unforgettable, but when traveling, it's even more daunting. Ah, to think you made it to Mareille — hopefully you will return. 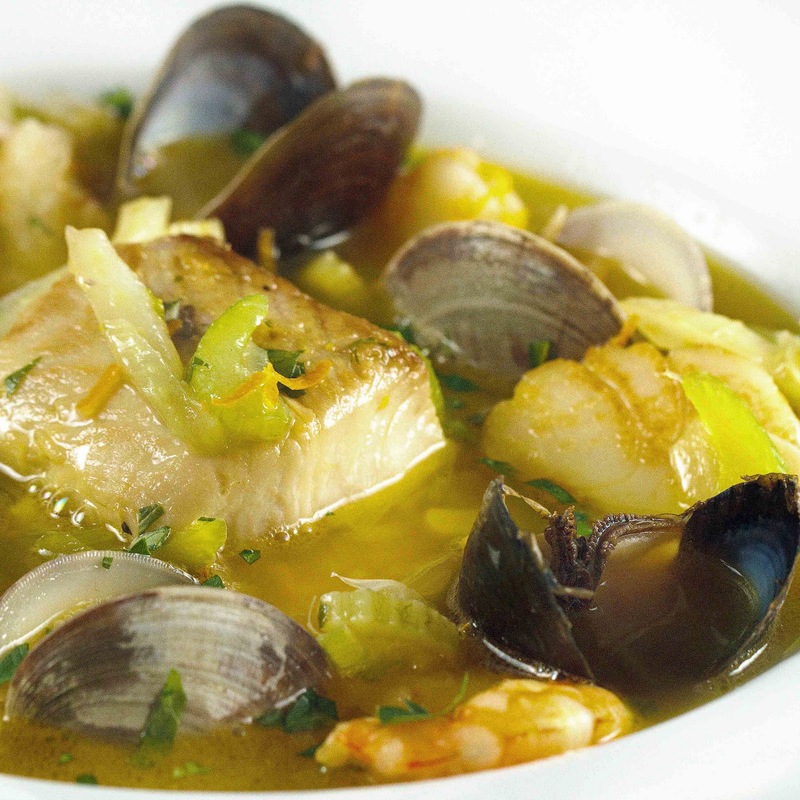 This Bouillabaisse looks absolutely perfect! Bouillabaisse is one of my favorite things to eat. I haven't made it since culinary school. Yours look amazing, makes me want to go out and get the ingredients and make one myself. This sounds perfect just about right now. I think I need to make this for my hubby. Beautiful pics! We, American are so used to our AC's… lol. Happy Tuesday! Stunning photos, Dennis! Wow, they are just gorgeous, magazine worthy little gems. I've never had such a stew, but I'm intrigued to try. I enjoyed your story, and can relate to the broken AC issue. This is a remarkable Boillabaisse! I made a very quick one on weekend but I have to try yours and take the time. Thanks for sharing. I adore fish soups such as this. I am so excited that this one looks like something I will make! Thank you so much for sharing your fun story and lovely recipe. Also, loved your muffin recipe on Monet's site. vey nice of you. I am inspired to prepare this recipe. That's one gorgeous bowl of food, Chef Dennis! Congrats on Top 9! I absolutely love bouillabaisse, and yours looks fantastic. I like to combine everything at the end too. Now I'm craving some. I really need to stop looking at food blogs when I have no food in my fridge. Pure torture. Fantastic! My friends go crazy in Marseille!! I love bouillabaisse; I always rate a restaurant by trying their fish soup or stew (there are so many kinds and I like them all). What is great about bouillabaisse is that one can use the ugliest fish and it's still perfect! Your trip was very interesting, to say the least! Am I right? And it's a great story to tell, I'm sure! What a great story … travelling can be such a challenge sometimes, but life IS good! Ad so is your classic fish soup! beautiful presentation! I like the idea of fortifying the stock with a bit of chicken broth too. Lovely updated version of Bouillabaisse! Ahhh…train strikes in France…truely a part of everyday life but they do lead to some amazing adventures! haha what a funny story! it sounds like a very french experience. i've wondered sometimes when the french sleep. gorgeous photos too…hm any chance you could do a post or a sub-post on a good recipe for fish stock some time? i can manage beef and chicken, but fish perplexes me! but you do it so well. i'd love to see how you come up with your base. Hi sweet man…what a great post. I love hearing about my friends' traveling adventures. And I can relate to having no AC while in Europe. Been there! Thank you for sharing this lovely soup recipe. I can imagine how delicious a spoonful of that fennel broth would be. And thank you for such a delightful guest post. I'm going to be sharing it later on tonight or tomorrow morning. Much love. Sorry to hear that about the AC and the train debacle! Nothing like a strike ti put a bit of a damper on your trip. Can't wait to hear about Paris though! 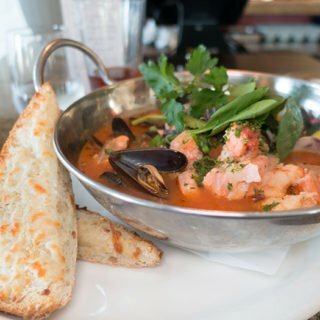 Your Bouillabaisse looks positively divine – I soo wish I had a bowl of it in front of me with a chilled glass of rose. Looking forward to your next delicious post – Cheers! I LOVE Bouillabaisse! I'm so glad you posted this because although I love it, I've never cooked it at home. Don't you just love southern France… Thanks for posting this great recipe. It's a keeper. What a great post and a beautiful soup too. Looks so fresh and delicious! Love your photos too! You little tease – I want the rest of the story! But at least you left us with a grand recipe. 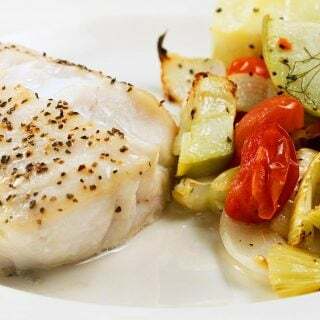 This looks wonderfully fresh – and I love the history behind these grand fish stews of the Mediterranean. I spent a few days in Aix long ago and far away and it is still crystal-clear in my mind. Maybe it's like Rome – you always go back? I've had a lot of funny/bad customer service experiences in France too. So frustrating, but I guess all you can do is laugh about it! This looks great! A fascinating travel tale, and I'm a sucker for bouillabaise 🙂 Dennis, I must say, these are some of your most stunning photos EVER! Keep up the great work! Dennis, nothing speaks to me better than a nice, peasant style bowl of fish stew, no matter how fancy of a name we call it… I make one with local bayou seafood that I dubbed "Bayoubaisse" and your version sure reminds me I need to get to cooking…. Your Bouillabaisse is beautiful! I love the combination of seafood you have used. This looks like it would be perfect for a spring dinner along with some crusty bread! Dennis, I made fish soup this week and a little about Marseille… how funny… we are on the same wavelength this week Your recipe looks delicious and loved the story! Your bouillaibaisse is mouth watering. but I have never made it. love your story about the fan, and your whole "French" experience. Great story and from my favorite place! I adore France. Your Bouillabaisse looks delightful. I will have to try your recipe. Thanks for the awesome tip about adding the seafood last, that is a great idea. The stew looks really delicious and full of flavor! Very nice, Chef! We will be there in June. Looking forward to it. Vive la France, eh? France is always and adventure, not as much as Italy, but still always interesting! They make up for it with their food, though, as you have just shown us. Délicieux! Thank you for taking me on a lovely vacation with you. I've never been to France, but I feel as though I've stuck my pinky toe in the water of a glorious pool I want to dive head first into. As always, it's a delight to read your work. If this tastes half as good as it looks, I'm sold. I too like the addition of the seafood at the end so it remains intact. Beautiful! Love to start the day with a little arm chair travel Dennis, especially to such a great food part of the world! Thanks for that. Perfect lead in to the beautiful soup. Merci! Hi Dennis-Loved reading your post about France, such wonderful memories for you. Your Bouillabaise is amazing…the broth is so clear, and gorgeous, and the seafood displayed are an absolute work of art. This is such a great story and is so very much French. I can imagine the shrug like it was happening in front of me! The bouillabaisse is fantastic. Wow. I don't know that I've ever had all that seafood in my kitchen at one time, but I guess I'm going to have to change that now! I love that you prepare meals with fish so much. You've inspired me to do a fish meal soon! Just when you think things can't get worse…..lol.. Thanks for sharing that story with us Chef! The stew looks lovely. I have never actually had bouillabaisse, which is surprising since i have such a love for fish/seafood! So beautiful it looks so delicious and delicate. I just want to dip some bread into that broth! I think your experiences must be a rite of passage for every visitors to France. Unaccommodating accomodation manager – check! Unhelpful public transport system – check! Noisy street cleaners – check! check! check! However, the food more than makes up for any downside. I spent a week in and around Aix – gorgeous! Your bouillabaisse brings back memories. Oh, my, that first photo has me drooling…I may have to make this when my sisters are visiting next month. The kids can have mac and cheese! I have some fish broth reserved in the freezer so I can make this… soon… very very soon. It just looks wonderful, Dennis! Thanks for sharing your travels with us (and for making us jealous ;-)! Oh your stories of traveling in France, at once wildly frustrating and yet, a fun adventure! This recipe, it's just lovely. Bouillabase is not the sort of thing I would normally attempt, but with your guidance, I might just do it! There always seems to be some type of strike in France, but I am dying to go back. 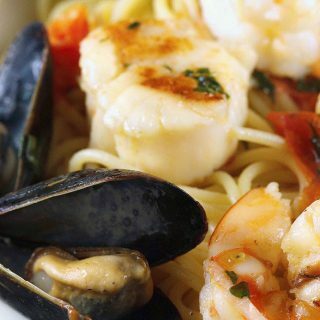 Your seafood recipe looks divine. Love the saffron in it. Love it! Your post reminds me of the times I was in France. This sounds like some of our trips. I love bouillabaise, but have only had it in restaurants – I will definately make this. Oh Dennis, you made me laugh so much with your story. Welcome to France, where client is NOT king (you begging for the fan!) and they tend to strike… 😉 but we love the place. As you say, life is good. My beaux-parents live in Marseille, so you make me want to visit them for more of the wonderful Bouillabaise. Yours looks just stunning! I love bouillabaise and yours is absolutely mouthwatering! Chef, what a remarkable Boillabaisse! Aaaaa Bouillabaisse! I have never had, but I hear amazing things from my other half. We are admiring your version. France is so beautiful in so many ways and I'm not just talking about the phenomenal food either! Dennis, this is exactly what I was craving for tonight but I had leftovers instead. Bad deal if you ask me. I'll just enjoy looking at your beautiful bouillabaisse instead and smile at your story. My husband and I have had similar adventures. Not fun while in the middle of the experience but nice to reminisce about. Aix is a beautiful memory in my nomad life – I must make this to celebrate. My youth, my loves, my sharing. Thanks for the remembrance. I can just imagine that shrug, as in "it's not my problem". When we were in Paris, many years ago now, there was a public transportation strike. What a gorgeous dish! I love hearing (reading) stories about travel experiences. Most of my favorite dishes are recreations from places I've been. I love that first photo with the intense black background. The contrast with the white bowl is beautiful and really showcases the dish. 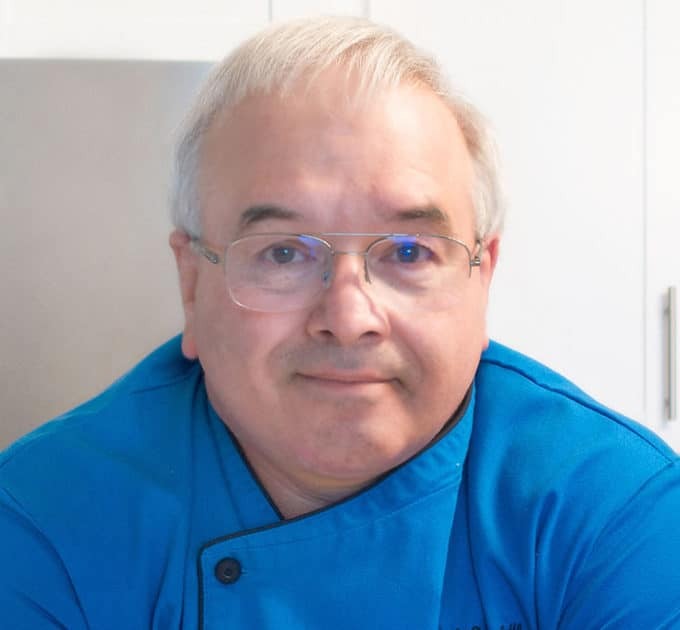 Have a wonderful week Chef Dennis! I had to LOL at the whole, no air, windows open (noise), then finally stops..only to let you sleep for one hour before the noise starts again…I felt like that alot when I would finally get Indy to sleep…something would wake her! Lovely Lovely, and very special dish. I like your presentation because of adding the seafood at the very end; a lovely soup.